This post was written by a very good friend of mine, Jess. She and her husband, Bryan (also a very good friend, who accompanied me for this blog post), are adventuresome diners and love to explore local spots. I wish I had more of that in my DNA! Jess was kind enough to vividly describe their anniversary dinner (happy belated anniversary you lovely couple!!) and Bryan was planful enough to take photos of many courses of this seemingly never-ending meal! He may have taken a cue from me, as some of the picture are of half-eaten dishes, or fully cleaned plates! But, that’s okay…it’s all a sign of a thoroughly enjoyed meal! I hope you enjoy their story as much as I did. My husband Bryan and I discovered the Holly Hotel last fall thanks to a Groupon deal, and since it was relatively close to our house (we live in the boonies, so nothing is close to us) and there seems to be a lack of chef-driven, seasonal menus anywhere in metro-Detroit, we thought we would give it a shot. 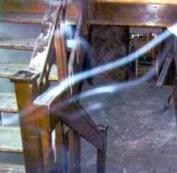 Plus, it has been around since the 1860s and is supposedly haunted—how much more can you ask for on a Groupon deal? Even if the meal sucked, maybe we would see a ghost. When we first walked in, we were a little surprised and not sure what to expect from the meal. I don’t think the interior has changed much since the hotel first opened, with the exception of adding some electricity. To add to the experience, we brought my parents along. They are well-traveled foodies, and have eaten at some of the best restaurants in the world. It turned out to be a wonderful evening, with fantastic food and great service, and an interpretation of the décor as being “shabby chic”. So, when it came to figuring out where we wanted to dine for our 1 year anniversary, we decided to go back to the Holly Hotel. Now, I should say that Bryan is a pretty adventurous eater. Snack Street in Beijing was like a playground to him, so he always chooses the chef-driven menus whenever he can. He did so during our first experience and decided that it worked so well, he wanted the chef-driven menu again. Since I had also chosen the chef-driven menu the first time, I thought I would mix it up and try some of their staple items during this dinner instead. And, we generally share so it works in our favor and we get to taste more of the menu. 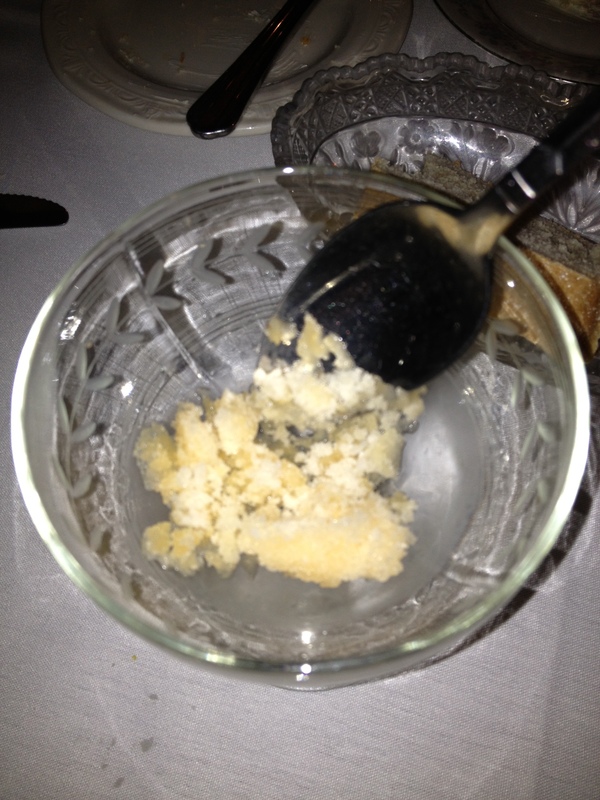 I say “generally” because there was a squabble over some black truffle mashed potatoes on this particular evening. Bryan’s meal started off with an amuse-bouche of chicken mushroom spring rolls with sriracha and yuzu (an Asian citrus). I had never had yuzu before, but it was pleasantly tart and paired well with the sriracha and the woodsy mushroom flavor, bringing a nice brightness to the spring roll. Luckily they gave Bryan two spring rolls, so I got to gnosh on one. For my starter, I had onion soup topped with a puff pastry, which was a unique twist and absolutely delicious. When I commented on my love for puff pastry to our server, she shared my opinion saying “I’d eat a dead cat if it was wrapped in puff pastry. In fact, I’d tell you that’s how I like my dead cat prepared”. I’m pretty sure “wrap it in puff pastry” didn’t make the list! Next, Bryan had a pumpkin parsnip soup, which he devoured. I love parsnips, especially seeing them used as a puree for heavier cuts of meat like short-ribs, but am not so much of a pumpkin fan, so this wasn’t my favorite. Even though I wasn’t in love with the pumpkin flavor, I have to say the texture was incredible—very thick but pureed finely, and lots of flavor. Meanwhile, I was still working on my onion soup. For the salad course, I had ordered a Bibb lettuce salad with shaved Bavarian ham, parmesan and a Dijon mustard dressing, but as soon as they served Bryan’s salad I knew I was going to have to forfeit mine. Bryan was served a spinach salad absolutely loaded with Stilton crumbles, Stilton dressing, beets and roasted corn. The problem: Bryan HATES blue cheese. The good news is that I love it, so we quickly switched. The blue cheese flavor was intense—if you aren’t a true lover of blue cheese I wouldn’t recommend this salad—and the roasted corn added a touch of sweetness that I really liked. As for my original salad… the Dijon dressing was the perfect blend of sweet and spicy, especially when paired with the slightly salty Bavarian ham. Not that I got to taste much of it. 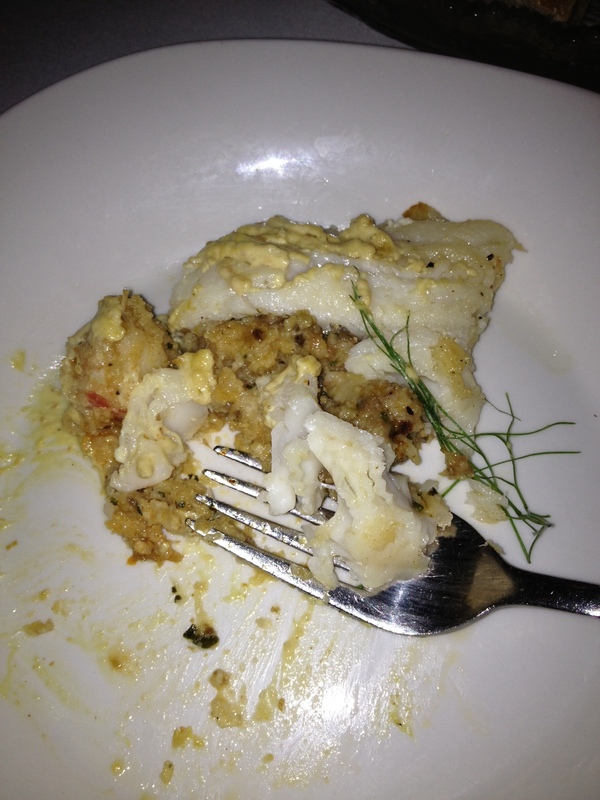 Next up for Bryan was flounder stuffed with chorizo and shrimp grits and topped with a champagne feta cream sauce. I am allergic to seafood, so Bryan was on his own here. 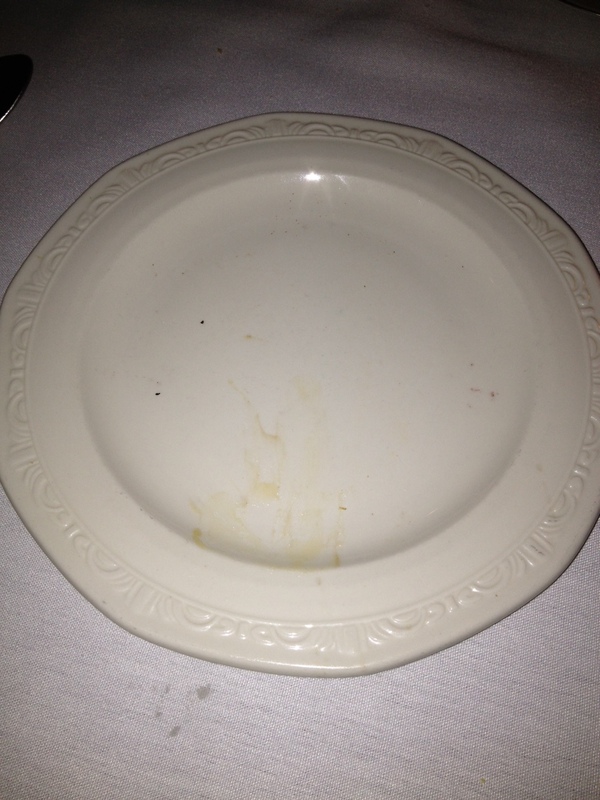 I was concerned about a lot of really strong flavors and how they would all mix together, especially the chorizo with flounder, and I was even more curious about a champagne feta sauce, but judging by the empty plate the server cleared away, apparently the flavor profiles were a success. After a quick orange sour palate cleanser (yummy! Not too tart and just the perfect amount of orange zest) we were finally on to the main course. 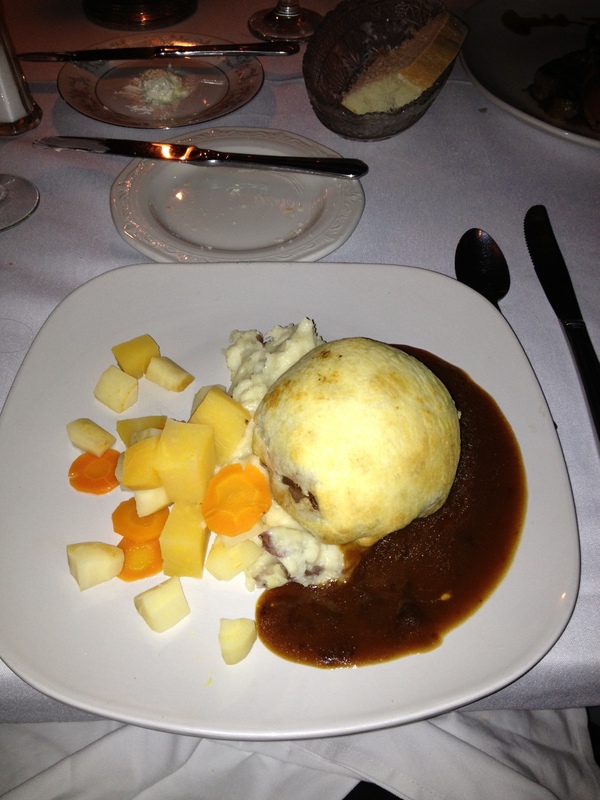 Beef Wellington is a signature dish for the Holly Hotel, and wanting to try some of their staple items, this was my choice. I was curious to see how they would handle this—not only is it a dish that has somewhat fallen out of fashion (along with Chateaubriand), but it is also extremely difficult to prepare, getting the correct temperature on the beef without overcooking the puff pastry. 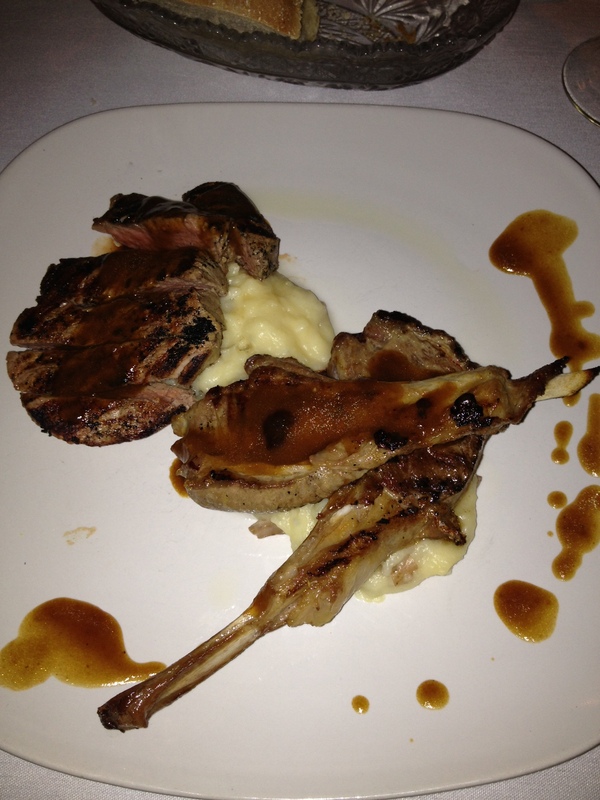 Bryan had Lollipop Lamb Chops, Filet Mignon and Black Truffle Red Skin Potatoes. Which is where our sharing-system broke down. First of all, my Beef Wellington was incredible. I’ve already mentioned my weakness for puff pastry, but throw in some flavorful, creamy mushroom duxelles on top of a tender filet and I am in heaven. I drifted off for a while, sipping my wine, enjoying my classic dish. It practically melted in my mouth. Bryan was also quiet, tucked into his lamb, filet and taters. Finally, we came back to earth, decided to engage in conversation again, and shared bites. Wow. Wowwowwowwow. His filet mignon was one of the most tender I have ever had, which is saying something, because filet mignon is my favorite dish – hands down. I almost always order it. His was like cutting through butter. I thought the beef wellington was good but this…. This was incredible. And the potatoes…. I don’t even know how to describe them. The black truffle took the flavor on the potatoes to mythic heights. When I reached for a second bite, I nearly got stabbed with Bryan’s fork. After some pleading on my end and reminding the hubby how kind I was to forfeit my original salad to him (not like that was really a loss for me since I love blue cheese, but whatever), I was allowed a second bite. A blissful, perfect little bite. I would go back to the Holly Hotel for those alone. Alas, soon the potatoes, the filet and my beef wellington were consumed and we were on to the cheese course. The server brought us (okay, technically Bryan) a tray of porter cheddar cheese, smoked cheddar, homemade caramel sauce, candied nuts and dried blueberries. 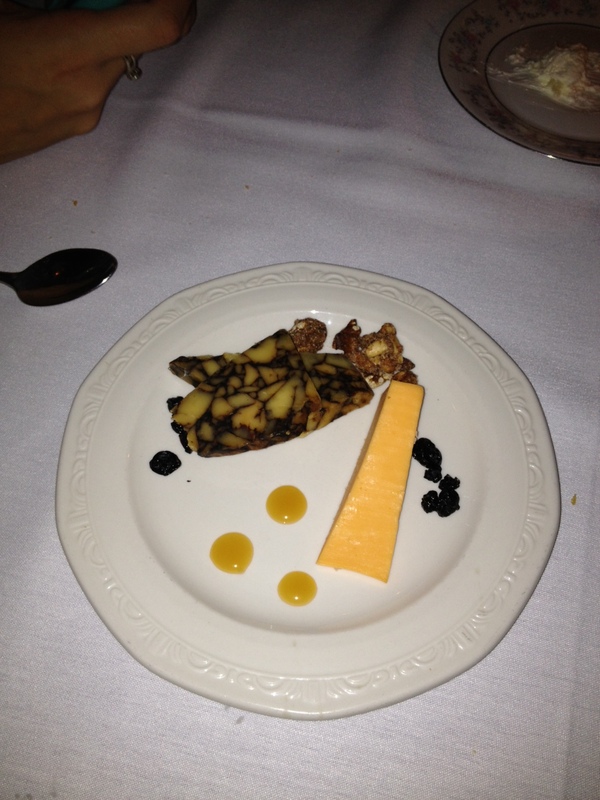 I am a fan of smoked cheddars and the smokiness of this one was a perfect complement to the heavier flavors of our dinner. I was also digging the caramel sauce and dried blueberries and even dipped the cheddar into the sauce, which was surprisingly good. As if we hadn’t been gluttonous enough at this point, Bryan had one more course to go—the dessert course. I had been eye-balling a puff pastry wrapped apple for dessert (are you sensing a theme here?) but Bryan’s trio of cheesecake was enough for the both of us (courtesy of the server, who knew it was our anniversary dinner) so I decided not to be piggish. We had a cheesecake slice topped with a chocolate and the aforementioned caramel sauce, one with a raspberry sauce and one with a strawberry sauce. Unfortunately, this was our least favorite dish of the night. 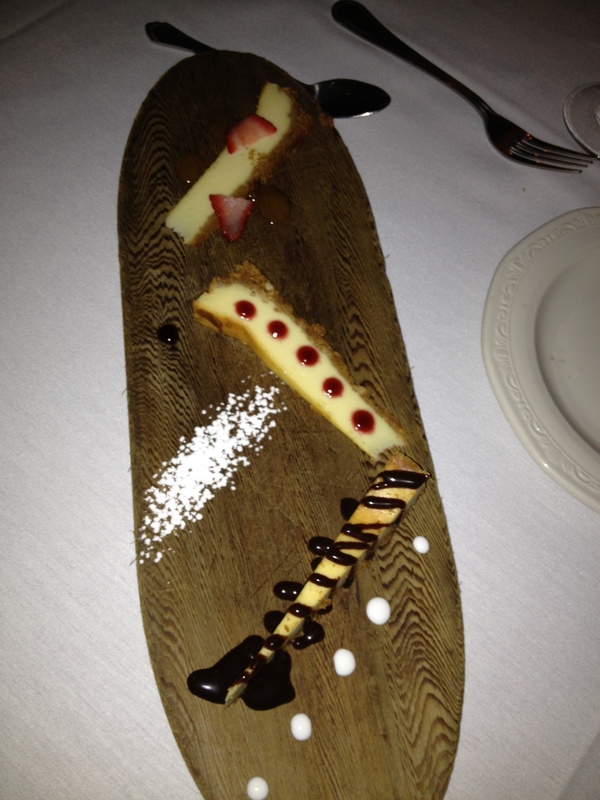 We found the cheesecake to be very dense and dry, and were somewhat disappointed to wrap up our otherwise incredible meal on this note. Overall though, our meal was amazing—the slightly kitschy atmosphere was quiet and romantic, the food was heavenly and our service was fantastic. We picked the perfect place to celebrate our anniversary, and it stacked up to our first experience there almost a year prior. In fact, it was so good that we became Dining Club members there, and will be taking my parents back when they are in town this weekend. So, for anyone in the metro-Detroit area who doesn’t mind a bit of a drive for a truly wonderful dining experience, we highly recommend the Holly Hotel. 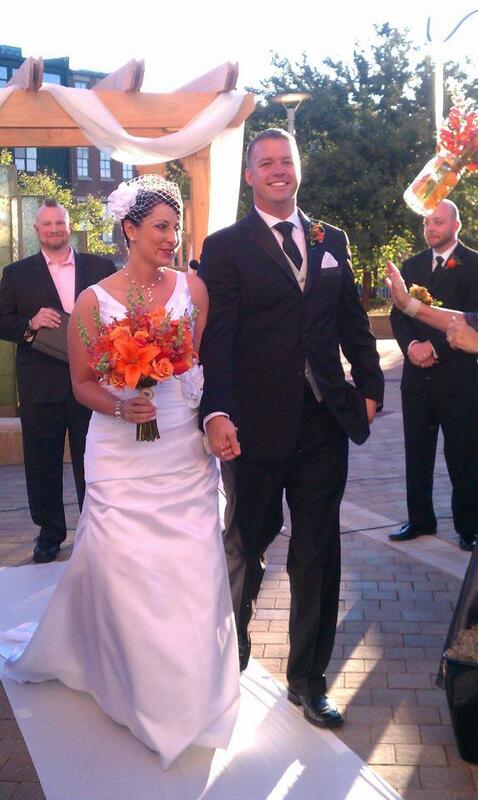 Thanks to Jess and Bryan for taking time from their romantic anniversary dinner to prepare a blog post! 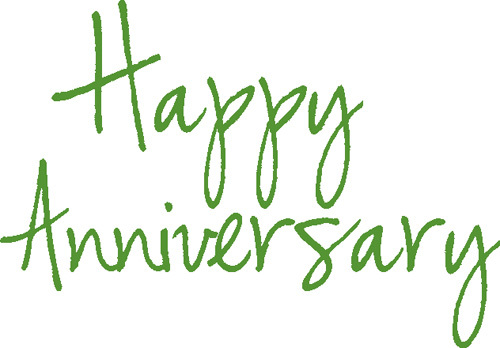 Yes, folks, I did razz them a bit about thinking so much about this blog while they were out celebrating such a special day! But, I love them for having done so! Now, I’m off to find dinner. After reading about eight delicious courses, I’m starved, friends! PS. Since I stopped writing my other blog, I don’t really have a good place to post general experiences. Since y’all must know about my adoration for my beloved Clemson Tigers, I’m going to direct you to my friend Anthony’s recap of our weekend in God’s Country last weekend. Thanks for the wonderful memories, Ant and everyone else with whom I spent QT in SC. xoxo. 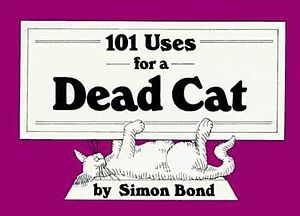 Love it, like the 101 uses for a dead cat addition! Did you send it to Holly Hotel? Thanks, Bryan! I made some small edits (referred back to our “date”, LOL, and added a link to a Clemson post) since you read it. I did post it to The Holly Hotel Facebook page. Feel free to send updates if you stumble across something fabulous again tonight! Enjoy dinner with the in-laws! Trust me, Ant, Bryan is too nice a guy to do that!